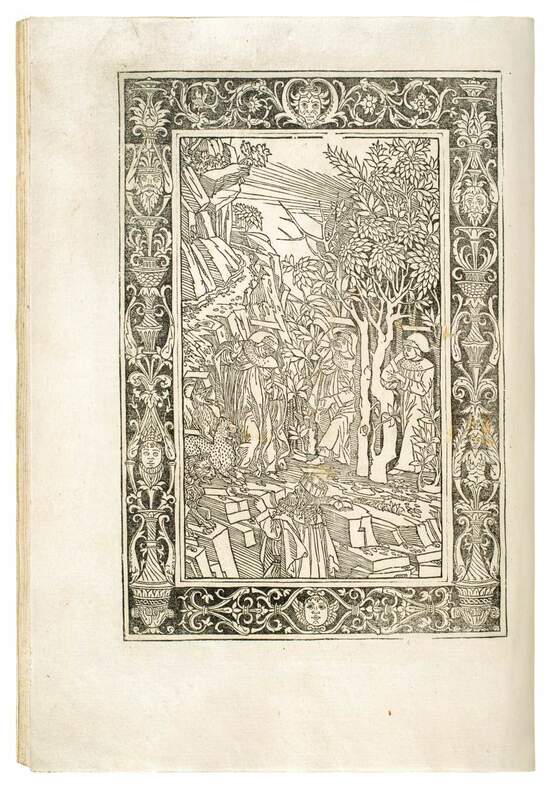 First Brescia edition of the Divine Comedy, Dante's major work. Commentary by Cristoforo Landino. Moreover, the first edition with woodcut illustration. The first 19 woodcuts are modelled after Botticelli’s engravings in the 1481 edition. The Divine Comedy, the major work of the celebrated medieval poet Dante Alighieri (1265-1321), is considered the greatest work of Italian literature and one of the most important works of world literature. The present edition is the second illustrated Dante, and the first with monumental, full-page woodcuts. The highly ambitious project intended opening illustrations for each of the 100 cantos. The first Inferno woodcuts show the influence of the engravings designed by Botticelli for the preceding 1481 Florentine edition. Only twenty engravings, however, are known to have been completed for that edition, and, from Canto XXI on, the Brescia artists strove to complete the illustrations in a style close to Botticelli’s compositions, as they clearly had no access to his original set of drawings. Their work is full of pictorial inventions and provided the prototype for the iconography of the following illustrated Dante editions.